Bassist Keala Kaumeheiwa was born in Oswego, New York and was raised in Marquette, Michigan. 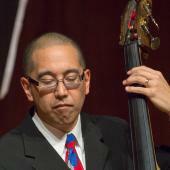 He received a Bachelor's of Music Degree from the University of Wisconsin-Madison, where he studied both jazz and classical music with renowned bassist Richard Davis. From Wisconsin, Keala moved to New York City, where he performed with the New York String Orchestra at Carnegie Hall and the Kennedy Center. After moving to the Boston area, Keala studied jazz bass and improvisation with legendary bassist Ron Carter as part of the inaugural class of the Thelonious Monk Institute of Jazz Performance at New England Conservatory. Meanwhile, he continued his classical bass studies with virtuoso bassist Donald Palma. While at the Monk Institute, Keala performed with Jimmy Heath, Jackie McLean, Herbie Hancock, Wayne Shorter, Wynton Marsalis, Bobby Watson, Harry "Sweets" Edison, and James Moody. Since 2001, Keala has been an Affiliated Artist at MIT, teaching Jazz Combo Ensembles. He has performed throughout Italy, at the Havana Jazz Festival as well as freelancing around Boston, frequently performing at Sculler's Jazz Club, Ryles, Wally's Jazz Cafe and the Regattabar.